Unusual applications call for unusual nets: the lifting net is suitable for safely airlifting goods and materials and transporting them to the predetermined place. Hence, the lifting net is deployed as a helicopter transportation net when for example carrying out an aerial rescue or delivering food supplies by airlift in the event of emergency service operations. Another frequent area of use is at locations where merchandise is handled. Here, these special lifting nets are moved by cranes. A load transportation net or lifting net is a square-cut net measuring up to 4 m x 4 m. It is made of knotless, extremely tear proof polypropylene, whose meshes are also square. The border edge consists of a 16 mm-thick nylon border rope. For optimal safety, two additional cross ropes run through the nets. At each corner are suspension loops, which are equipped with chafe protection. 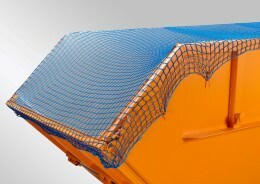 At safetynet365.com the transportation nets are available in different material thicknesses and mesh sizes, so that our load nets can carry loading capacities of from one to three tons. Reliable strap suspension gear with four straps is always required for load transportation nets. 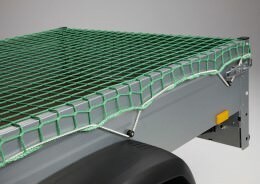 Safetynet365 offers a suspension model, which fulfils the highest standards, consists of a mixture of polyester and steel and has eyelet hooks that fit into the loops of all approved load transportation nets. When used correctly, its load-bearing capacity exceeds the maximum loading capacity of our load transportation nets, so that the hard-wearing polyester strap suspension gear can be used on any of our nets with no problem. We’re happy to advise you on choosing load nets and suitable strap suspension gear.